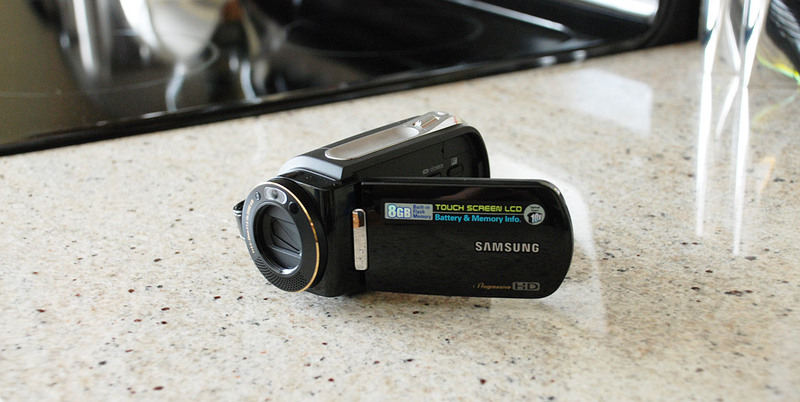 Around the time that I started getting annoyed with AVCHD and my Panasonic HDC-SD5, Samsung and MWW approached me about testing out the Samsung SC-HMX10 camcorder. After finding out that the HMX10C didn't use AVCHD and saved directly to friendly MP4 files, I gladly accepted. I've been playing around with the HD camcorder for a few days now and was rather surprised by it. For a sub-1000 camcorder (currently close to 530 USD on Amazon), the HMX10C feels about right. It's made of plastic and while the body feels sturdy overall, things like the battery/memory door feel flimsy. The silver accent plastic on the top of the camcorder attracts finger prints and appears to look dirty at times. My biggest issue with the build quality is the hand strap. It's made of very stiff leather-like material which makes holding the camera awkward. Other than that, the hinge for the touchscreen is strong and the camera is light at 11 ounces. The HMX10C, unlike other camcorders I have seen, includes 8GB of in-camera memory and an SDHC/MMC expansion slot. There's a good 10x optical zoom that you can use when taking advantage of the 720p High Definition video created by a 1.5MP sensor. It's not full 1920x1080 HD but for the things I do, like uploading video online (hopefully Flickr Video very soon), it's enough. It comes with HDMI and Component/AV hookups if you plan on connecting to a TV but most people will be happy with downloading files to their computer directly over USB. The 2.7-inch touchscreen can flip around. There are five quality settings: HD Super Fine, HD Fine, HD Normal, SD Standard and SD Economy. I've been quite content using the HD Fine setting. With the 8GB of internal memory that setting gives about 88 minutes of recording time. The HD Super Fine quality setting results in 77 minutes, HD Normal gives 118 minutes, SD Standard gives 266 minutes and SD Economy leaves you with 533 minutes of recording time. Don't get too carried away with those times though - the tiny 850mAh battery will only last an hour at best. HD Super Fine outputs H.264/AAC MP4 files with 2 audio channels and an approximate bit rate of 12 Mbps while HD Fine records at 9 Mbps and HD Normal at 6 Mbps. For those interested in working with external microphones, the HMX10C has a mini jack expansion port. I quickly found out how great this camcorder is compared to my AVCHD-using Panasonic camcorder. After transferring the videos to my Mac, I was immediately able to play them without converting anything. I was able to throw some HD videos online to Vimeo without fiddling with importing things into video editing software and editing stuff. Of course, if I want to add a title and all of that, editing would be necessary. One slight annoyance with HMX10C is that you have to manually open and close the lens cover. I had become used to a motorized lens cover on the other camcorder but for being considerably cheaper, I can live with it. Door open to show battery and SDHC expansion card (card not included). At the HMX10C's price point, I didn't expect to see any fancy video tweaks and I didn't. Instead I received a good touchscreen interface with a solid set of basic features. Working with the touchscreen is a breeze and menus are not overly complex in anyway. I liked the LED light on the front of the camcorder for shooting in the dark but being just a single LED it's pretty useless. Small features like anti-shake help with basic video control but there's no substitute for a steady hand or tripod. I've taken a few example videos to show off the quality of the HMX10C. I'm providing the links to the pages on Vimeo as embedding them here doesn't show the HD version. I've noticed that video taken in darker areas tends to turn out grainy but this was also the case with my other camcorder and in my experience seems to be a trend among the sub-1000 camcorders. I can't tell if some of the videos skip or if that's just my computer. Vimeo recommends uploading HD videos at 1280x720 with a bit rate of 3-5 Mbps. I took them straight from the HMX10C, which was around 9-12 Mbps with my settings, so that could be the reason. I'll sum up the HMX10C as "good performance at a price that doesn't break the bank." It's a solid entry-level HD camcorder that I highly recommend. Just be sure to purchase an extra battery if you plan on using it continuously for long periods of time. The Samsung SC-HMX10C receives 8 out of 10 Stammys. Disclosure: The camcorder in this review is on loan from Samsung and MWW. Note: Yes, I will be posting my thoughts on the MacBook Air soon.